Administrators describe the corporate server and service configuration ruleset in a central, auditable place. 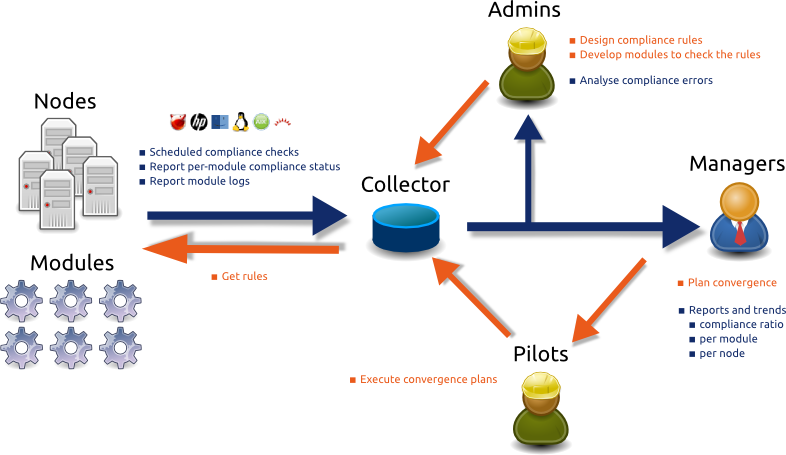 The OpenSVC agent modules compare the actual configurations to the expected configurations and log the result to the collector. The compliance framework can naturally be used for host post-installation. 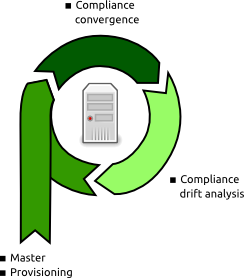 This strategy avoids extra maintenance of a systems post-installation framework, and ensures a newly delivered host is compliant with the current ruleset and is checked for drift after its delivery. The compliance framework uses 3 types of objects. For detailled information about rulesets, read this page. Rules are variable/value pairs exported by the OpenSVC agent in the execution environment of the modules. A rule value can be complex, for example a json-serialized dictionnary. OpenSVC ships with a library of compliance objects and corresponding rule edition wizard. Using the objects in modules code abstracts the complex rule parsing, and using the wizards hides the json structures from the designer. Rules are grouped into rulesets. 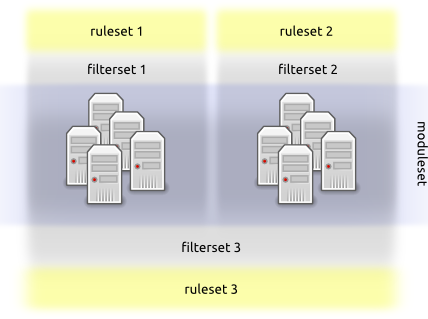 Rulesets can be explicitely attached to nodes or services, or contextually presented to nodes and services through a filterset. A filter is a SQL-like condition on information available to the collector. Filterable information categories are : nodes, services, service resources, service status, disks, tags, moduleset attachments, application codes and node hbas. Filters must be grouped into filtersets. Filtersets can be grouped into filtersets. Modules apply and verify the rules. Modules are grouped into modulesets. Modulesets are explicitely attached to nodes or services. Modules from attached modulesets are executed by the agent scheduler in check or fix mode depending on the autofix modules property set by the designer. Rulesets can be encapsulated in modulesets. Rules of attached rulesets are visible to all modules of attached modulesets. Rules of rulesets encapsulated in a moduleset are only visible to all modules of the parent modulesets modulesets. Each module picks the rules it is coded to pick. Different groups, responsible for different sets of nodes and services, can define different and private compliance targets. For example, the front and back-office servers can be under the responsability of different teams. In this case, each team won't want to see the ruleset maintained by the other team. The collector allows designers to control publication of modulesets and rulesets through publication group attachments, so that they are visible and attachable from services and nodes only if their ownership matches a publication group. Users of those groups who are in the CompManager privilege group are allow the modify the compliance object. Users of those groups are allowed to see the compliance object in the designer. Nodes and services under responsability of those groups are allowed to use the compliance object. the orange ownership-to-publication chains link the moduleset and ruleset to the node and services, meaning the endpoint moduleset and ruleset are visible and attachable from the node and services at the other end of the chains. In other words, Ruleset and Moduleset are visible and attachable only from Node1 and Service2 because they are published to Group2, responsible of Node1 and Service2. the blue ownership-to-publication chains do not link the moduleset and ruleset to the nodes and services, meaning the endpoint moduleset and ruleset are not visible nor attachable from the node and services at the other end of the chains. In other words, Ruleset and Moduleset are not visible nor attachable from Node2 and Service1 because they not published to Group1 and Group3. service-to-ruleset and service-to-moduleset habilitation chains have an additional link : the service application code. This registry is rendered by the Admin > Apps view. © Copyright 2017, OpenSVC SARL.